Feiwel & Friends, 9781250078285, 336pp. 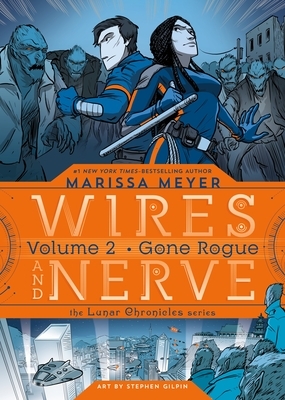 The second graphic novel, and sequel to Wires and Nerve, Volume 1, from #1 New York Times and USA Today Bestseller Marissa Meyer! The world of the Lunar Chronicles comes alive in this thrilling continuation of Wires and Nerve. Iko—an audacious android and best friend to the Lunar Queen Cinder—has been tasked with hunting down Alpha Lysander Steele, the leader of a rogue band of bioengineered wolf-soldiers who threaten to undo the tenuous peace agreement between Earth and Luna. Unless Cinder can reverse the mutations that were forced on them years before, Steele and his soldiers plan to satisfy their monstrous appetites with a massacre of the innocent people of Earth. And to show he's serious, Steele is taking hostages. Cinder and Kai, Scarlet and Wolf, Cress and Thorne, and Winter and Jacin all feature in this epic new battle. But it is Iko who must face her deepest fears when she uncovers the truth about her own unusual programming. Questions of love, friendship, and mortality take Iko on an emotional journey that will satisfy and delight fans of this bestselling series. Stephen Gilpin lives and works in a cave just north of Hiawatha, Kansas, with his wife, their kids, and an infestation of dogs. He is the illustrator of numerous books, including Pirate Mom, Sneezy the Snowman, and James Patterson's Pottymouth and Stoopid.